While the $1 billion mark is largely an arbitrary milestone, it is still a figure that brings attention and at least a perception of legitimacy from media and investors. We’ve seen billion-dollar ‘Unicorn’ startups appear almost overnight in industries such as Augmented Reality, Drones, and the Internet of Things. But the Cryptocurrency & Blockchain space has been slow to join the club. At this year’s IoT Tech/Blockchain Expo in London, Blockchain-based startups were described as having “passed the proof-of-concept stage” in the eyes of investors, but funding was still largely coming from within the community itself, with rewards unlikely to appear in the near future while the industry is still largely in its nascent stage, especially outside the realm of finance. 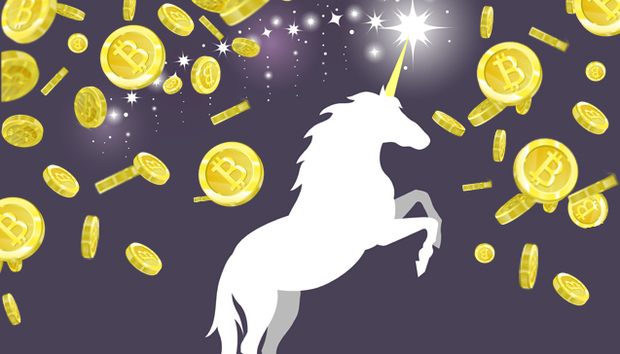 According to a 2015 report from technology M&A specialists Magister Advisors, we were due to get five Bitcoin/Blockchain-based Unicorns in 2016. We actually saw zero. Fast forward to August 2017 and Coinbase officially became the first crypto Unicorn [Cryptocorn, maybe?] after the digital currency exchange raised $100 million on its Series D investment round for a valuation of $1.6 billion. Investors include Institutional Venture Partners, Spark Capital, Greylock Partners, Battery Ventures, Section 32, and Draper Associates. However, it might be a while before Coinbase has any Blockchain-based company in the traditional Unicorn club. According to CB Insights, July saw Blockchain deals fell to their lowest point since Q4 2013, fuelled in part by a massive rise in Initial Coin Offerings (ICOs). ICOs see companies create and issue their own digital currency, which are bought as an investment that can be sold once the tokens achieve higher values. Though controversial and falling foul of regulators, they are increasingly popular. According to CB Insights data, 135 blockchain startups have closed ICOs greater than $500,000 since 2014, but have increased in number massively in recent months. According to CoinSchedule data, there have been over 200 ICOs in 2017 totalling more than $3 billion. Last year saw fewer than 50 ICOs, totalling less than $100 million.